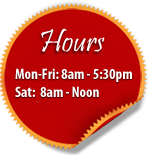 We are a full service veterinary clinic offering complete surgical, medical, dental, laboratory, and radiology services for your animals. Dogs and cats are our primary patients; though, our veterinarians treat large animals, reptiles, pocket pets, and some birds. The Hastings Veterinary Clinic has been part of the Hastings, MN business community since 1963. The success of our long-standing business is attributed to our dedication to our patients and their owners. Our commitment includes 24 hour emergency services for our established patients; we are here for our patients when they need us. • House calls available for at home euthanasia for a peaceful goodbye. * Proud to be rated by Consumer’s Checkbook #1 in the southeast metropolitan area and #9 in the entire metropolitan region for quality and value!